High Availability is a feature that actively keeps your data synced on two separate yet identical NAS. If one needs maintenance, the other will immediately take over the reins without as much as a blip in service. Your data will always be available. In the event of an improper shutdown, data may be lost – a potentially catastrophic event in the business environment. A Dual Disk On Module (DOM) design, however, means that all your data (even the firmware) will be safely stored and recovered, ensuring flawless operation and maximum uptime. RAID storage technology is the most efficient way to protect your data. By combining multiple hard drives for improved performance and protection against data loss, your data is more secure than if it were just stored on a CD, flash drive, or single hard disk. When it comes to data management, Thecus NAS truly let you have it your way. Create multiple RAID volumes each supporting different RAID modes including RAID 0, 1, 5, 6, 10, 50, 60 and JBOD for your own balance of performance and data protection. Effective and uninterrupted network communication is achieved in two ways. First, 802.3ad uses the bandwidth of available related ports to share transmissions evenly. And second, if the main network connection fails, failover mode uses a main port for incoming and outgoing traffic between the two devices while the others are kept as backup. With the addition of an extra power supply, users are ensured that important data will never be lost, even in the event of a failure in the system’s power supply unit (PSU). If you often handle sensitive or operation-critical data, a redundant power supply is a way to ensure that your data and workflow are always safe. Does your NAS box ever get really hot and worry you? 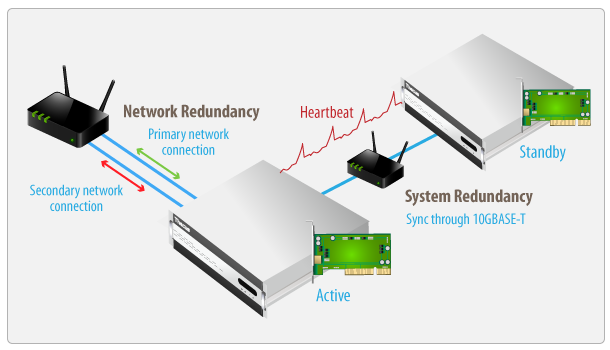 System fan redundancy is the solution to keeping your NAS running smoothly. The inclusion of a backup fan ensures that users will always have a consistently cool and healthy NAS setup.